Today the gallery start hanging the exhibition. An exciting thought. I won't see it until next week and can hardly wait. This is the boat builders shed in North Haven, Penobscot Bay, Maine. A couple of years ago the winner of The Aspect Prize was Katie Pope. This week Katie is being featured on the Aspect Prize blog. We have a link. This is the advert for the forthcoming exhibition in the current RA Magazine. 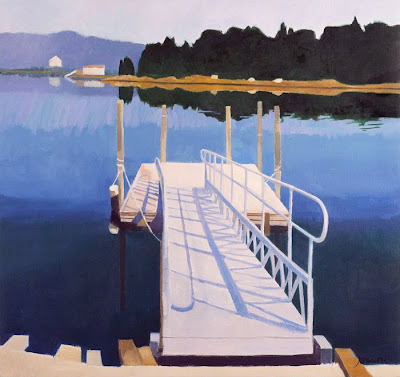 This is a small painting of the Opera House in Stonington in Maine. Liked this door in London. This wee painting is based on the field in front of a lovely house in Maine owned by a lady called Peggy. 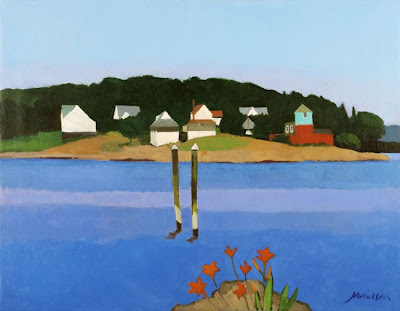 This painting is of Orrs Island from Baillie Island in Maine. The exhibition catalogue is being printed today so the gallery should have it by the beginning of next week. Watch out too for the RA Magazine which comes out this week. The exhibition is advertised within. The weather has been so ghastly recently that I thought a sunny garden picture was best for morale. Reckon this is smokers revenge. Stuffing cigarettes into air vents in buildings. It made me laugh. Another New England image to tempt you to come along and see my exhibition at The Richmond Hill Gallery from September 10th. This was a quiet early morning on Deer Island in Maine. 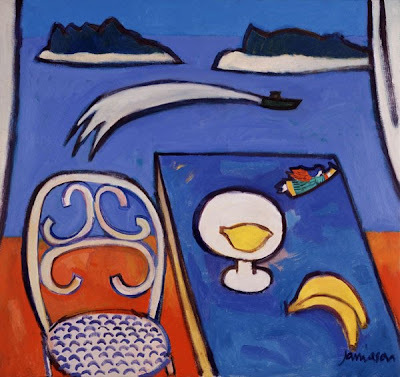 Opening tonight at The House for an Art Lover in Glasgow is an exhibition of paintings by several members of The Paisley Art Institute. Opening 6-8pm. I'll be there. The painting of the road amongst the vineyards near Moiré in Beaujolais will be there too. Exhibition runs until 21st September. Went to see the Plinth in Trafalgar Square the week before last and was lucky enough to see artist Peter McNiven painting a self portrait. He received a well deserved round of applause from the public at the end of his hour. Well done that man. 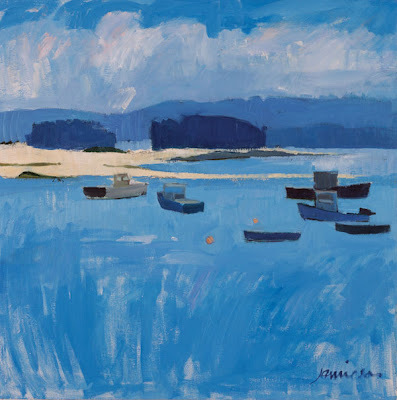 Here's another New England painting to whet your appetite for the September exhibition at The Richmond Hill Gallery. This one is 'Boats at Stonington'. Stonington is on Deer Island in the north of Penobscot Bay and is so called because it was once the site of a massive stone quarry. Stone from here was used to build the Brooklyn Bridge. These days Stonington is a lobster fishing town. Time for some early morning garden shots. It's been a while since I uploaded garden photos and I've had requests...so here you are. Nice lettering on a barge in Little Venice, London. 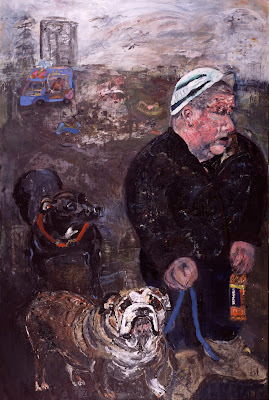 As we get closer to the show at The Richmond Hill Gallery in September I'll put a few more of the works on the blog. This is 'Penobscot Lemon Angel'. Oil on canvas. These wonderful garden chairs are on sale in a garden centre in London. Came across them last week. Today the designs for the catalogue of my new exhibition are going to the printer. 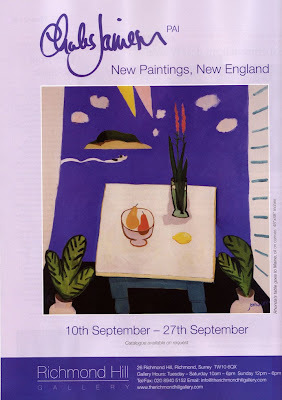 This is an exhibition of paintings of New England which is in The Richmond Hill Gallery, Richmond, Surrey in September. 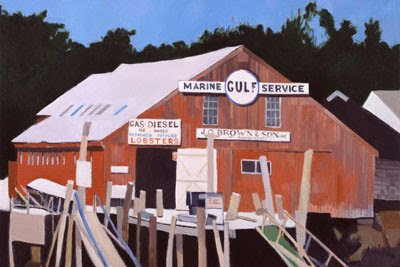 The painting is of a boat builders shed in North Haven, Penobscot Bay. The Glasgow Show 2009 on Glasgow Green was great fun. Lots to see and do. Do not try any of the above!